The kind of stupid where unapologetic fun takes over while pensive thoughts are left at the door and only the simplest pleasures remain because sometimes you don’t really care about symbolism or approach, you simply want to see something that is so straightforward that any additional thoughts would somehow ruin the movie going experience. Now, I’ve always preached that horror movies are purely entertainment for this Vault Master and I stand true to my word. Of course, horror movies can go a little or A LOT deeper than just pure entertainment but for my purpose of watching horror flicks, entertainment will always be the first priority and further evaluation usually comes in during or after the entertainment has commenced. There are horror flicks however that bluntly celebrates this sort of absurdity by never going out of their way to be too clever in the way of story-telling, character development, dialogue, etc. but purely targeting the pleasure zones of all horror movie goers where you want to see some honest to goodness, gruesome fun. 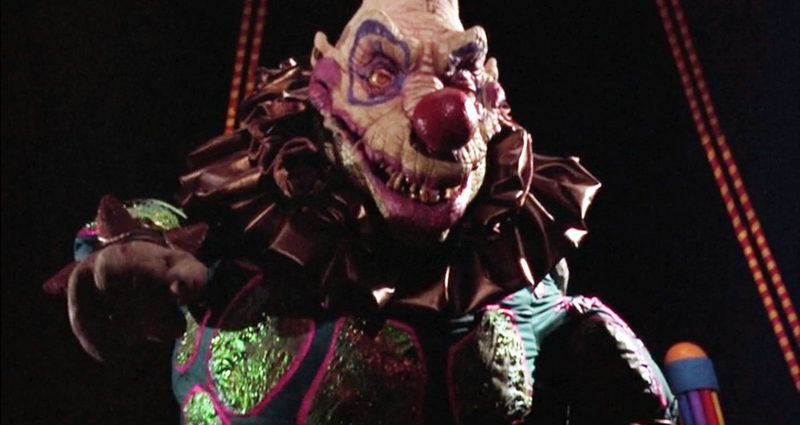 Killer Klowns from Outer Space constantly feels like its poking fun at itself but at the same time, you’d be quite the clown (see what I did there?) to think that this movie didn’t take itself seriously because my FearTASTIC friends, this flick was quite serious in bringing in the FUN. This is a breed movie that is a dying breed where the filmmakers were successful in making a silly horror movie without the audience being in on the joke. It’s quite simple; there will always be a better reaction to silliness if the audience believes that you took your film very seriously. Once the audience has figured out that the filmmakers and actors also find this whole ordeal to be idiotic, the audience tends to generally agree. The problem with a lot of the silly horror films that are coming out nowadays is that the audience is already in on the joke before the movie starts. 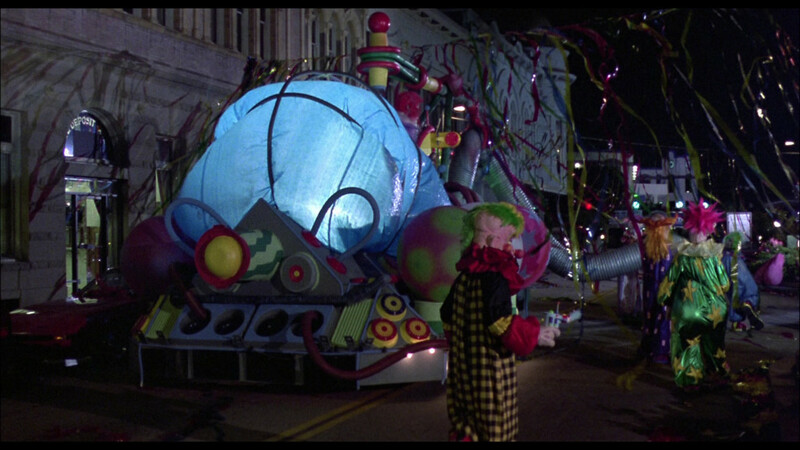 For your next party-planning event, KILLER KLOWNS INC! Cotton Candy Pods…yeah, that pretty much speaks for itself. Never ask Killer Klowns to pimp your ride, EVER. There is no sense that the movie is trying to be serious so the audience already starts shaking their head in shame before the opening credits begin to roll. 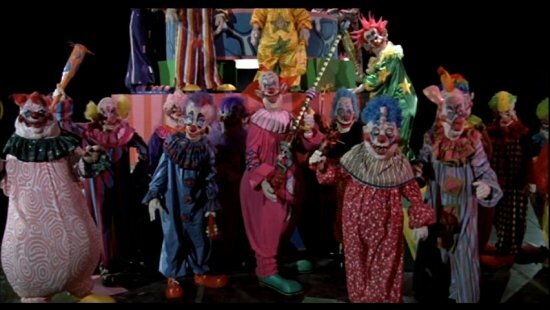 Silly horror movies such as Killer Klowns were so artful in the sense that they were making a solid, stupid horror movie that was intentionally fun but was also quite serious in their execution. 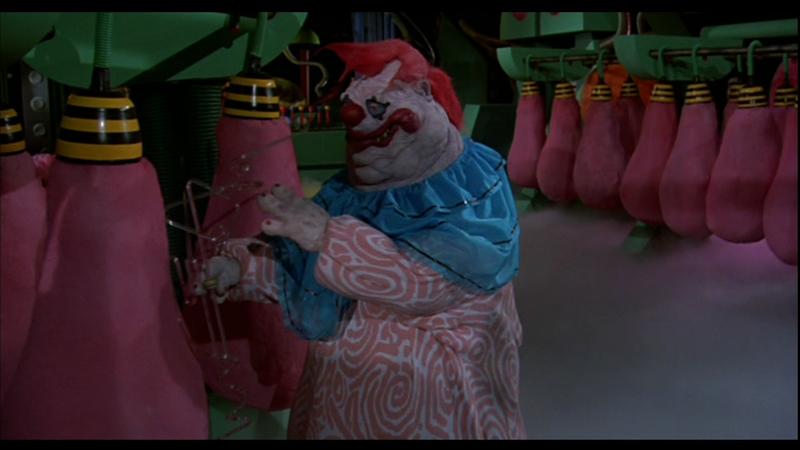 The actors were never really “winking” at their audience through their dialogue, but rather reacting to monstrous aliens that happen to look like clowns in a way that didn’t come off sarcastic. Of course, some of this will come off as corny as times, but at least it was genuine acting as opposed to acting knowing that the audience already thinks this is a stupid movie. The potential consequence of presenting a movie that you know is stupid is that the audience tends to agree and not give it another thought but if you present a stupid movie that has the intention of a fun execution, the audience will potentially rally around you and possibly make your movie the next cult sensation! The movie’s plot is pure simplicity where a guy and girl with the intentions for some make-out action stumble upon an alien invasion involving clown – looking aliens looking to abduct humans for their nefarious plot. 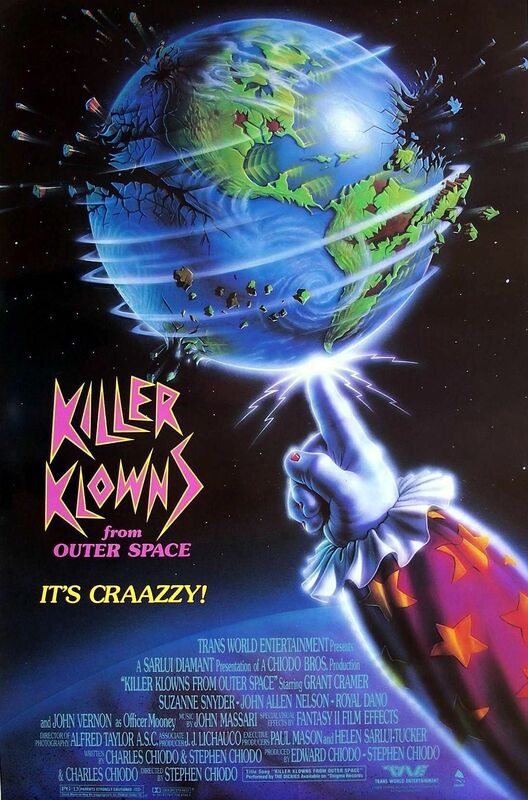 As stupid as this premise sounds, I will always remember watching this flick as a kid and having such a good time because although the kills consisted of cotton candy, silly looking guns and clowns with sharp crocodile – style teeth, it was executed in a way where I can feel the filmmakers feeling proud that I was laughing as my eyes were glued to the screen. They probably know they weren’t making the next Godfather series but they presented it in a fashion where it did not seem insincere and this FearTASTIC Vault Keeper will always appreciate a movie that is genuine entertainment and not forced; yes, I’m calling out 95% of all SyFy flicks, get your act together! Just when you thought it was safe to Poop once again. 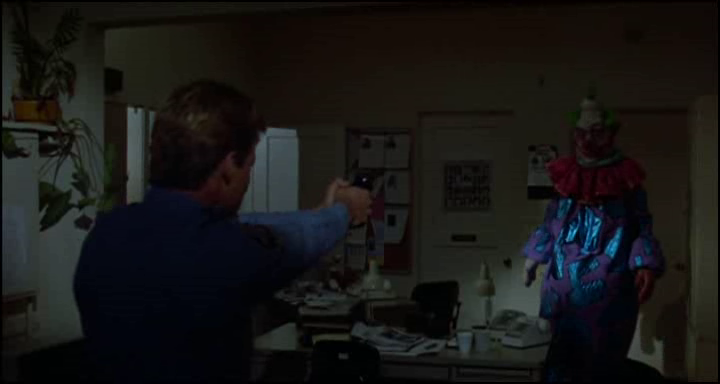 And now for a really odd episode of Law & Order. As much as I pegged this flick as a silly, stupid movie that is equally endearing, I have friends/colleagues/acquaintances that will go nowhere NEAR this flick. Enter Coulrophobia, the fear of clowns; as silly as this flick seems to me, there will always be something about childhood figures turned into something terrifyingly gruesome that will never sit well with some folks, no matter how silly the plot. So I challenge you my FearTASTIC Vault O’ Fun FREAKS to grab someone you know who has this fear and pop in this flick. Perhaps the amount of absurdity this movie brings will make them think it’s so stupid and fun to the point where the fear could somehow be slightly alleviated…or perhaps the giant clown boss at that turns up around the end of the flick may scar them for life, OOPS, SPOILER ALERT (don’t tell them of course, tee hee tee hee)! Before Sunrise, during the sunset and after midnight.